Are We Witnessing the Start of a Paradigm Shift in Energy Politics? The year 2016 appears poised to bring a groundswell of change in global trade and politics. In Venezuela, President Maduro’s political mandate is withering alongside economic growth. In the Middle East, an increasingly anxious Saudi Arabia is sparring with Iran, with consequences resonating throughout the region. Asia’s economic growth is slowing along with industrial production, while in Russia it has already come to a screeching halt, with a projected GDP contraction of 3.4 percent for the year ahead. These seemingly disparate events do not have much to do with the price of tea in China, but they have a lot to do with the global price of oil. In June 2008, a barrel of oil cost $138. The global financial crisis of that year sent demand into a tailspin, but oil soon recovered its value and remained around $100 for most of the following five years. It seemed too steady to drop, and producers worldwide were prospering and planning with this “fact” in mind. By 2011, shale was preparing to change everything. Although shale extraction has been around since the 1970s, it really took off in the late 2000s when a combination of lax regulations and emerging technologies allowed U.S. companies to cheaply exploit the massive rock-based horizontal deposits of oil and gas. The United States, over the span of a few years, went from a major net importer of crude oil to one of its largest producers. Naturally, this created an immediate oversupply of oil, and prices began to drop. The Organization of the Petroleum Exporting Countries (OPEC), which more or less controls global oil production margins, decided to pump out more oil to match new producers and not lose out on market share. Nearly every major producer followed suit and we now have a situation in which the daily global surplus of oil is growing at a rate of about 1.5 million barrels per day and is projected to slightly outpace demand throughout , even as prices drop and producers fall out of business—creating an all-out price war. Adding fuel to the fire, in 2015 the United States lifted its forty-year ban on crude oil exports, injecting more liquidity into an already flooded market. As the largest consumer of oil begins to spew out barrels faster than it can consume them itself, and the second and third largest consumers, China and the EU, respectively, continue to suffer protracted economic slowdown, it is clear that demand will not rise enough to solve this imbalance. That same barrel of oil that was $138 in 2008 and $100 in 2014, costs about $30 today. Some experts would have you believe that oil will rebound quickly. This assumption largely rests upon shaky foundations, foremost the idea that plummeting capital investments in the oil industry, expected to contract 25 percent this year, will have an immediate impact on prices. They will not. The experts who utilize historical precedent and clear data believe it will be at least 2–4 years before the price of oil even begins to recover. This dramatic turn of events is already fueling political and economic instability from Russia to Venezuela, and everywhere with oil wells in between. In Saudi Arabia and Nigeria, oil accounts for about three-quarters of the national budget. The former is blessed with abundant foreign reserves of dollars, insulating it for now. The latter is in more dire straits, with unpaid government workers already threatening suit with the United Nations. But a more troubling outcome of Saudi Arabia’s compromised position may be the boiling-over of tensions with Iran. Though it takes a certain level of reductionism to conclude that the Sunni-Shiite divide in the Middle East boils down specifically to oil, geography does lend a degree of credibility to this theory. 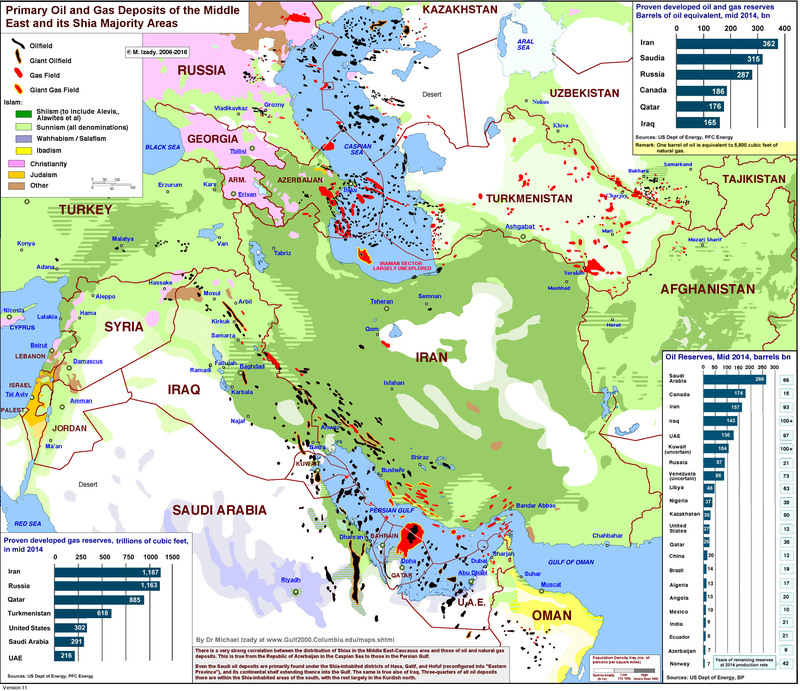 This map, courtesy of Dr. Michael Izady’s work at Columbia University, shows how most major deposits of oil and gas in the region, and within Saudi Arabia itself, rest in Shiite-majority territory. This adds a new relevance to Saudi concern about Iranian influence over Shiite populations in the region. Additionally, as sanctions have ended, Iran has begun implementing a plan to carve out a piece of its former stake in the global oil market. Their oil minister claims they can boost output by a staggering one million barrels within a month to regain lost market share from 2011. Venezuela, the country with the world’s largest oil reserves, has had its economy rocked by falling oil prices. Venezuela is the textbook definition of a country stuck in the “natural resource trap.” Let me save you the $42 for the hardcover by explaining. After all, that is a barrel-full in today’s oil market. A “natural resource trap” is a situation in which a country experiences global commodity price shocks as volatility in every area of its economic and political life. When price is high, the government nationalizes resources and redistributes the income. When it is low, they call on private investors to save the day. As a dramatic shift occurs in Venezuelan politics, bringing moderate conservatives into power for the first time in over 17 years, the only surprise is how quickly this phenomenon can take effect. The repercussions of this economic collapse are being felt by left-wing regimes across the region who miss their former patrón. In many ways, it can explain Cuba’s eagerness to open to the United States, a milestone in Obama’s foreign policy legacy for better or worse. But the situation may be the worst for Russia, now isolated economically and politically. Moreover, it is overstretched militarily and ideologically, constraining its options moving forward. In what seems to be a divinely inspired fit of poetic justice, Deputy Finance Minister Maxim Oreshkin responded to the crisis by claiming, “We will live in a different reality,” leaving us wondering—which new reality will Russia live in next? Every $20 the price of oil has dropped from $100, Russia has had to decrease its budget, again and again slashing every sector save its “holy orthodox” defense budget. Russia’s economy is more diversified than many of its South American and Middle Eastern counterparts, with energy resources only accounting for about 50 percent of the state budget. Still, the Russian government’s poker face toward mounting economic stress is becoming more transparent, and this will continue as they cut their propaganda budget. Unfortunately for the finance ministry, that means they will not be getting better speechwriters anytime soon. So what comes next? All this is remarkably similar to the oil price plunge of 1986, but this time U.S. shale producers are not rolling over to the Saudis as easily. Though the number of rigs in the United States is dropping along with production, efficiency per rig is increasing across the board. U.S. producers are proving remarkably adaptable to lower pricing environments. Demand also looks slow to recover as oil-intensive industries are struggling worldwide, nations are reaching agreements to bring their carbon emissions down, and new fuel efficiency standards are flat-lining energy demand growth. Ultimately and somewhat obviously, traditional producers of petrol that for decades have profited from resource scarcity will be the big losers. But what is still uncertain is how far the effects of their collapse will spill into other sectors of the global economy. Some predict recession, citing a rapid rise in distressed energy loans in the United States; a drying up of petrodollars in countries like Russia, Venezuela, and Saudi Arabia; and damage to growing economies such as China’s (caused by a strengthened dollar), as indicators of a looming global recession. This presents a compelling argument, at least in the short-term while savings from low energy costs are still being transferred to consumers. Political and economic instability are an inevitable outcome of market shifts of this magnitude, but there is still much room for optimism. As argued by energy security experts Gal Luft and Anne Korin in their 2009 book Turning Oil into Salt, a future in which oil is no longer a strategic resource—but just a regular energy commodity—is a safer, cleaner, and more stable one. Hopefully, despite short-term political trauma and damage to the global economy, this new paradigm could give rise to a brighter energy future in decades to come. Jason Czerwiec is a Fulbright Student in Lithuania and Junior Fellow at the American Foreign Policy Council where he specializes in energy security and Baltic security issues. He graduated from DePaul University with a BA in international studies in 2014. Follow him on Twitter for insights into politics, international relations, and NBA basketball.